If you've been to a Disney Park here in the US, you can't swing your double stroller around in a store like the Emporium on MainStreet USA without seeing some form of merchandise with the name of the park on it. There's shirts and mugs with Magic Kingdom on them. There's tons of items with Epcot Center on it - including some vintage logo things like hats. Same with Animal Kingdom and Hollywood Studios. Then there's all the merchandise that have the opening year of the entire resort on them like WDW '71. But, one of the things that I noticed during my trips to the Tokyo parks was that there isn't a lot of stuff that they sell that actually has the name of the parks/resort on the merchandise. There's ONE shirt that I found - a plain grey shirt with blue words on it that has the park names on it in each of Land and Sea parks. No kids clothes with the name of the resort/parks what so ever. What they DO have is what I'd describe as character-focused crazy stuff. Especially the clothes. Here's a good piece from the Disney Tourist Blog that runs down the merchandise situation at the Tokyo parks. 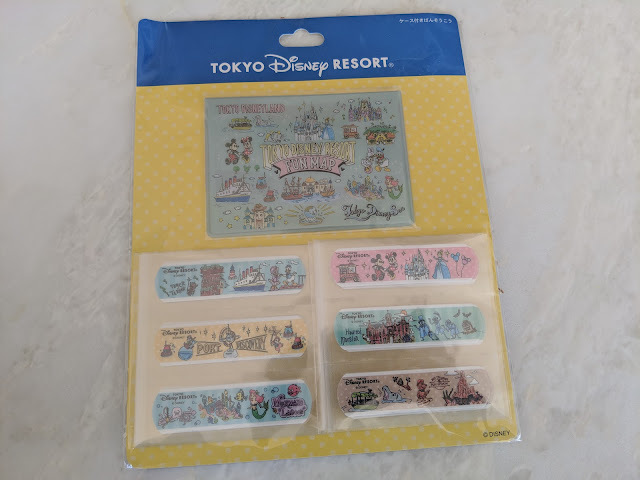 So, with the situation being that there isn't a lot of 'park-specific' stuff for sale, I was on the hunt to find the littlest of things that I could bring home for the kids that had the words "Tokyo Disney" on them. I already mentioned the 35th Anniversary celebration pin for the Tokyo Disney Resort that I grabbed. That post is here. In one of the stores, I found this weird set of band-aids. And a little carrier. It is pretty cute and was reasonably priced, so I grabbed it. You can click on the photo to see a closer look or click here to see a version of Google Photos that you can zoom into really close to see the details. When we got home, the Babe opened up this full package and packed each of the sets of band-aids away in the little travel case. These are kinda funny, right? I mean...they're fancy band-aids. But after all, they're really just that: band-aids.